A new analysis has revealed which areas in the UK are most likely to be targeted by burglars, with Guildford taking the top spot. Price comparison website MoneySuperMarket analysed millions home insurance quotes to identify postcodes with the highest and lowest claim rate for home contents theft. Major cities, including Birmingham, Manchester and Leeds, were in the top five hardest hit postcode areas on the list. Which? takes a look at the most affected areas and whether your home insurance will cover you if your home is targeted. By analysing over two million home insurance quotes from its website over the past two years, MoneySuperMarket identified postcodes with the highest and lowest rates of burglary claims. Guildford (GU3) has risen to the top of the rankings, with a rate of 52.3 claims per 1,000 quotes, despite not appearing at all in last year’s top 20. Cambridge (CB5) came in second – a sharp increase from last year’s 12th place – with a rate of 51.4 claims per 1,000 quotes. Manchester (M21), Leeds (LS5) and Birmingham (B15) were also among the hardest hit, coming in third, fourth and fifth respectively. Only postcodes with at least 200 quotes were included in the final rankings. Find out more: making a home insurance claim. On average, the value of claims in winter was 37% higher than those made in summer, the data revealed. This may be explained by the presence of high-value Christmas presents in the home, within easy reach of an intruder. Overall, the value of insurance for laptops, jewellery, watches and bicycles has also grown over the last year. The average collective value of itemised possessions – meaning items listed on contents polices because of their high value – was £4,192 per policy in autumn 2016. This represents a 39% increase since 2011. Find out more: home insurers offering free extra cover at Christmas. Bideford in North Devon (EX39) has the lowest rate of burglary claims, with only 0.78 claims per 1,000 quotes. 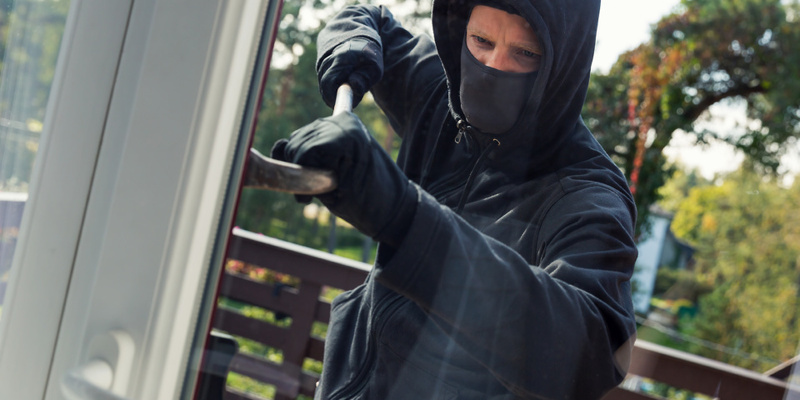 Other areas with low rates of home intruders include the Murton area in County Durham (SR7) with a rate of 1.09 per 1,000 quotes, and Tiverton (EX16), the second area in Devon to feature in the lowest five. There are a further 101 postal districts with no recorded burglary claims. Does home insurance cover burglary? Most home insurance policies will cover you if your home is burgled, but there are limitations which could lead to your claim being rejected. Most home insurers require your home to be protected by a minimum level of security. Generally, this would include deadlocks on external doors and locks on accessible windows. If you forget to lock your doors while popping to the shops, for example, your home insurer may reject your claim. Investing in more robust security systems, such as burglar alarms and cameras, can help reduce your premium. But they must be in proper working order – your claim could be rejected if you forget to set your security alarm before going to bed, for example. High-value items, such as phones, laptops and jewellery are often sought-after by thieves, but may not be automatically covered by your home insurer. Depending on your home insurance policy, you may need to get additional cover to protect items above a certain value. If you are underinsured, your home insurance provider may reject your claim or pay out less than the value of your lost item. Most home insurance policies specify that your home should not be left unoccupied for more than 30 consecutive days. If a burglary takes place while your home is empty for a period longer than 30 days – due to an extended holiday for example – your claim may be rejected. Some insurers may allow you to put extra cover into place while you’re on an extended trip but be sure to check with your provider first. It is vital that you double check the terms and conditions of your home insurance policy, as well as updating your home insurer of any changes to your circumstances, to ensure that you have the cover you need. Find out more: Home insurance: add-ons, fees and charges explained. Shopping around for the best deal can save you significant sums. Check out our short video on how to find the best home insurance policies. For more tips, take a look at our comprehensive home insurance guide or have a read of our home insurance company reviews to gain a better idea of the policies available and whether they are right for you.